"Sticker shock" may be the best term to describe the malady that is hitting independent pharmacists. They arrive at work - mostly behind the prescription counters at small drugstores - and, when they turn on their computers, are shocked by sudden and drastic price increases for generic medicines. In November, one pharmaceutical vendor increased the price of a tube of prescription cream to treat athlete's foot by more than 800 percent. In April, the price of one generic antibiotic went from about 15 cents a capsule to more than $2.70 a capsule, an increase of more than 1,700 percent. "It is like a surprise, every day," said Doug Hess, a pharmacist who owns Doug's Family Pharmacy in Caernarvon Township. Brandon Wiley, who is head pharmacist and manager at Wiley's Pharmacy in East Hempfield Township, Lancaster County, said he once paid $20 or $30 for 500-tablet bottles of the antibiotic, Doxycycline, that he would use to fill many prescriptions. "Now, it is over $1,000 for the same bottle," he said. A lot of people buying prescriptions don't feel the financial hit - at least not immediately - because their prescription insurance plans require only a co-pay. But Robert Frankil, who lives in Montgomery County and owns an independent pharmacy in Bucks County, said the complex and confusing financial relationships that cloud the connection between drugmakers and drug consumers - involving vastly profitable companies called "pharmacy benefits managers" - affect the public at large. Frankil went to Washington in November to testify before a U.S. Senate hearing on the spikes in generic drug prices. "Eventually, there is a trickle down to everyone," he said in an interview. "When you look at the rate of drug increases in price compared to the rate of inflation, it is ridiculous." After the hearing, Sen. Bernie Sanders, a Vermont independent, issued a statement that said drug companies have seen an opportunity to make a lot of money and have seized the opportunity. "There is greed at work in the pharmaceutical industry," Sanders said. He and Rep. Elijah Cummings, D-Md., have introduced legislation that would require drug companies to reimburse Medicaid if they raise the prices of generic drugs more quickly than the rate of inflation. A spokesman for the Washington-based Generic Pharmaceutical Association, a trade group, responded to questions by referring to statements issued in November by association President and CEO Ralph G. Neas. "This legislation once again misses the forest for the trees," Neas said, referring to the Sanders-Cummings initiative. "In actuality, generic drugs continue to be a resounding success in lowering health care costs and benefiting patients. Indeed, generics saved $239 billion in 2013 - a 14 percent increase in savings from 2012 - and more than $1.46 trillion over the recent decade." Neas cited a report from Express Scripts, the largest pharmacy benefits management company, that showed that since 2008, the price of brand drugs has almost doubled, but the price of generic drugs has been cut roughly in half. Regardless, John Norton, a spokesman for the Virginia-based National Community Pharmacists Association, said the price spikes cannot be a good thing. "If you are having huge and relatively random price increases you are going to have problems," Norton said. Independent pharmacists have their own point of contention with so-called "PBM" companies. 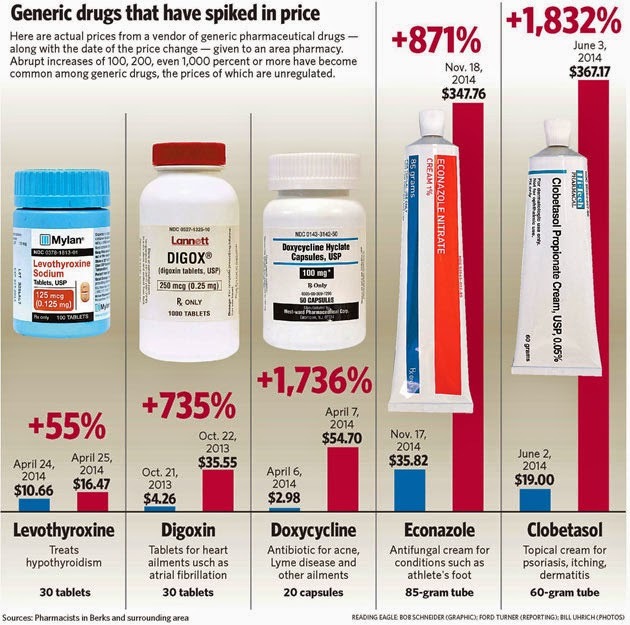 When a manufacturer suddenly increases the cost of a generic drug, the PBM sometimes does not boost its reimbursement payment to match the new price for several months, they said. That means the independent pharmacy must swallow the price difference for a time. "We are selling the drug at a loss until the increase," Wiley said. Express Scripts Holding Company's stock, traded on NASDAQ, has doubled in price in the past three years. Lawmakers in Harrisburg also have heard testimony concerning drug prices. In 2013, at a state House committee hearing on proposed pharmacy benefit management legislation, Express Scripts spokesman Dave Dederichs said the company's use of PBM "tools" has helped slow the increase in costs of prescription drugs. "We are here today in opposition to the draft PBM legislation, which will act as a hindrance on the aforementioned tools to lower prescription drug costs for both plan sponsors and consumers," Dederichs said in submitted testimony. Such statements fly in the face of what independent pharmacists frequently see. Eric Esterbrook, owner of Esterbrook Pharmacy in West Reading, recalled the morning he came to work and was told by staffers that the price of Doxycycline had skyrocketed. "We were all just dumbfounded," Esterbrook said. "It was just shocking."